"This book is, quite simply, a brilliant and original phenomenological reading of Jungian psychology" - C. Aanstoos, The Humanistic Psychologist. "Brooke's book reveals a profound understanding of the spirit of Jung's thought. Perhaps the freshness and depth of his insights could only have come from a clinician who was not technically trained as an analyst, but rather, was self-trained to step outside of western conceptual structures enough to be able to read the "text" of Jung's work with the same kind of imaginative eye that guided Jung himself" - Ronald Schenk, The San Francisco Institute Library Journal. "In itself this work is a stimulating piece of post-Jungian scholarship which cannot be ignored for its erudite discussion and creation of a unique forum on the boundaries of analytical psychology and phenomenology. It is no small achievement and must stand out as one of the few books in the vast plethora of recent Jungian literature to examine radically the basis of analytical psychology" - Jeremy Carrette, Harvest. "Although not an analyst, Brooke sees analytical psychology from the inside and articulates the soul of Jung's endeavor…. [The book's] phenomenological descriptions of the symbolic life sparkle with luminous openings onto our everyday experience…. Brooke leads us out of the dead ends which some of our Jungian metaphors have created, and he does so without abolishing our familiar images. He opens them up for us and deepens our analytical experience" - John Haule, The Journal of Analytical Psychology. 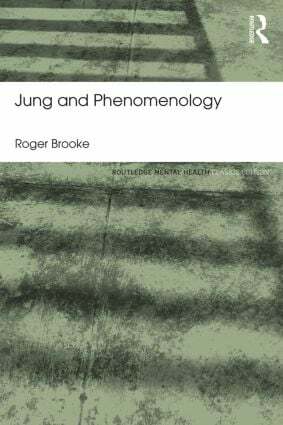 "Brooke's conclusion [quoted] is, I believe, as straightforward an assessment of Jung's relationship to phenomenology as we can expect. I feel in debt to Brooke not simply for his having provided such, but for his great intellectual skill in delineating it both convincingly and with academic impartiality" - Ernesto Spinelli, Journal of the Society for Existential Analysis. "In conclusion, Brooke is to be commended for his honest and significant contribution to psychology and existential thought" - Edward Murray, The Journal of Phenomenological Psychology. "Brooke's serious and careful reading of Jung is a masterful, strong reading going beyond the letter of his work and beyond many partial and cursory critiques…. His thought is rigorous, and he has brought the eye of the scholar and astute psychologist to the inner tensions of a tradition asking to be born out of the pregnant seed still unflowered at the core of Jung's work" - Stanton Marlan, Psychologist-Psychoanalyst. "Brooke gives us a fresh, original and illuminating reading of Jung which is very thought-provoking. Much of what appears to be so esoteric and mystifying in Jung's work is translated into more existential terms here…Brooke's book is unquestionably a serious study and an extremely scholarly one" - Michael Parker, Australian and New Zealand Journal of Psychiatry. "This book is a profound reading that challenges both analytic psychology and phenomenological psychology. Neither should be the same after Brooke's book…. Jung and Phenomenology is a groundbreaking work far surpassing previous phenomenological attempts to address Jung's work. It is theoretically astute, with clear clinical relevance" - Robert Kugelman, New Ideas in Psychology.